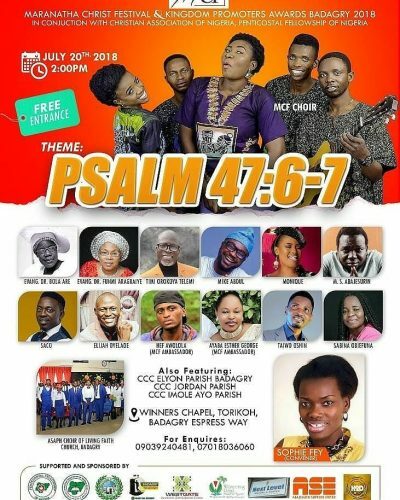 Organizers of Maranatha Christ Festival and Kingdom Promoters Awards in conjunction with Christian Association of Nigeria and Pentecostal Fellowship of Nigeria presents "Maranatha Christfest 2018", tagged "Psalm 47: 6-7".The event which will take place on the 20th of July, 2018, at Winners Chapel, Torikoh, Badagry Expressway, will feature MCF Choir, Evangelist Dr. Bola Are, Evangelist Dr. Funmi Aragbaiye, Evangelist Timi Osukoya (Telemi), Mike Abdul, Monique, M.S. Abajesurin, Elijah Oyelade, Saco, Hef Awolola, Ayaba Esther George, Taiwo Oshin, Sabina Obiefuna among others. According to the convener of the event Sophie Fey, other music ministers that will also minister at the occasion are, Asaph choir of Living Faith Church Badagry, CCC Elyon parish Badagry, CCC Jordan parish Badagry and CCC Imole Ayo parish Badagry.